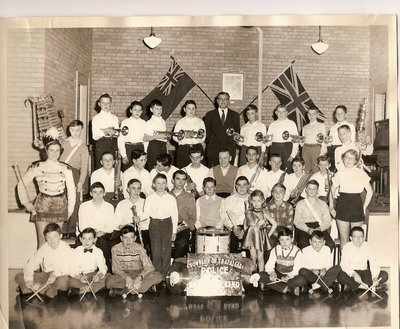 A formal photograph of the bugle band with drum corps taken in the late 1950's. The three majorettes are: the older teen is Barb Priestly, the young girl is (Grace) Elizabeth Wilson and to our right is Jean Crutcher. Drummer Walter Wilson, brother of Elizabeth, is wearing a bow tie, sitting in the front row. Harry Wilson was the first officer hired by Trafalgar Township Policeman, Fred Oliver, in 1952. Harry had previously worked for the OPP (Ontario Provincial Police). Briefly: in 1948 Fred Oliver was selected from 110 applicants and appointed the Police Chief of Trafalgar Township. Along with his police duties, he was also the truant officer, dog catcher and building inspector for the Township of Trafalgar. Fred policed from Lake Ontario on the south to Hornby, Ontario on the north and to Burloak Drive, as we know it now, on the west. His area included the Village of Bronte and excluded the Town of Oakville. Oakville was south of the Queen Elizabeth Way at that time and did not include the Ford plant lands. The population of this area was approximately 5,500. Fred worked alone out of his residence until 1952 when he hired a second officer, Harry Wilson. Dated as the late 1950's because Elizabeth Wilson was born in 1950. The Wilson siblings continued with the band into the 1960's. Walter Fredrick Wilson, called Walt, b.1947. Grace Elizabeth Wilson, called Elizabeth, b.1950. William Henry Wilson, called Harry, b.1955.